Puzzle Time - Super Inky! Today Violet and I decided to make the puzzle I got for New Year! 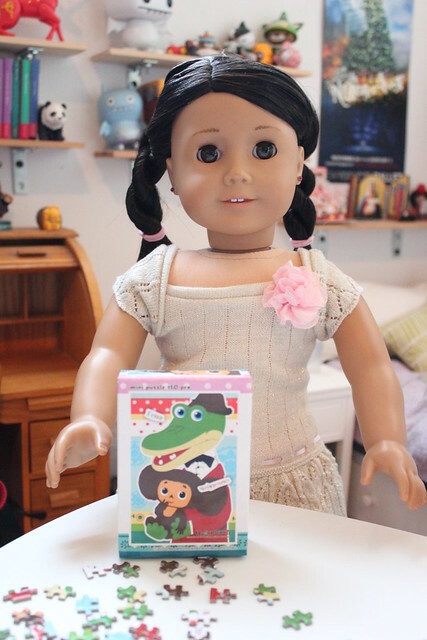 This is the puzzle we decided to do- it's Cheburashka and Crocodile Gena, from the Russian cartoons. First, I carefully dumped out the pieces onto the table and made sure none of them fell on the floor. Then Violet and I carefully separated the edge pieces from the rest. We started with the edges and then worked inward. I think this is a good puzzle strategy, but I'm not an expert! The pieces are really tiny, don't you think? 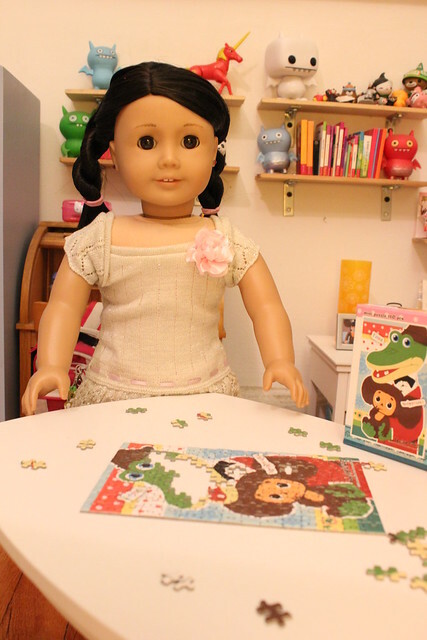 Here's Violet the with the puzzle when we were almost finished. It took us so long that it got dark outside! We did it! Hurrah! Have you ever built a puzzle? What was the picture? 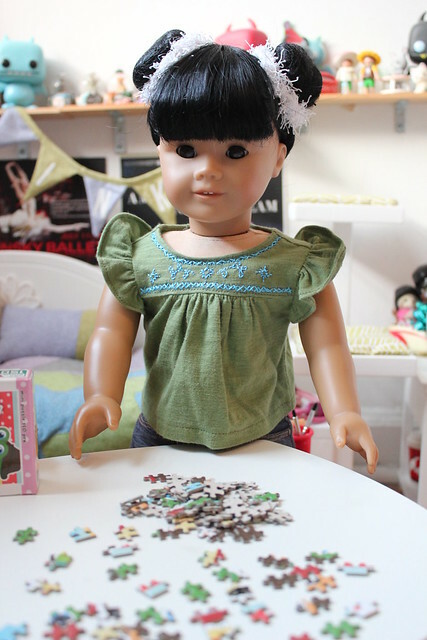 In this entry I'm wearing: shirt from Royal Doll Boutique (hand embroidered by my Mama) and jeans from American Girl Place. Privet, Inky! I am very jealous of your puzzle! 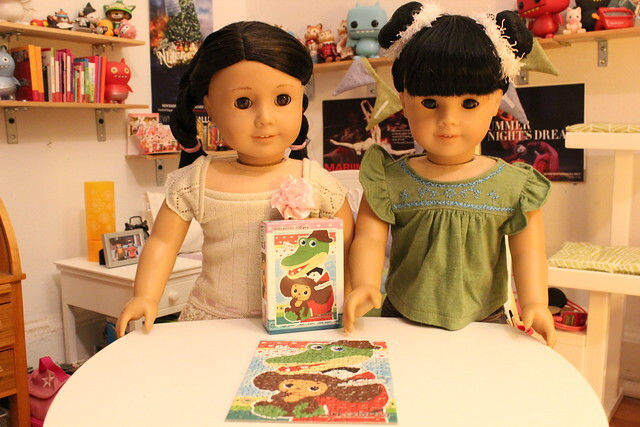 I wish I had a Cheburashka puzzle! Don't worry Katia! 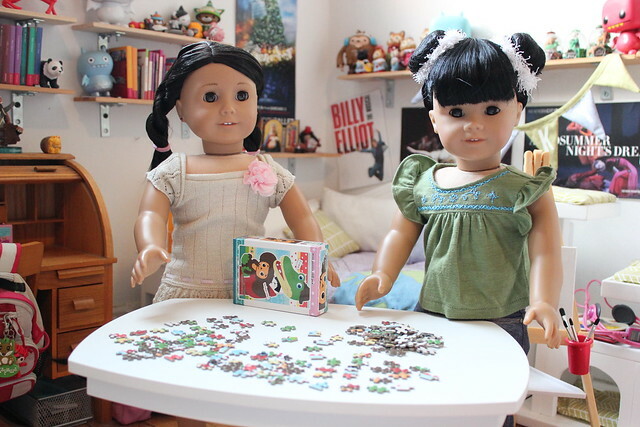 We'll find you a Cheburashka puzzle eventually! I'm sorry they didn't have any more for you. Inky, I love your room! Is so organized and nicely decorated! Your puzzle is so cute. It does look a bit complicated, though. You and Violet are such pretty girls! We're building a Star Wars puzzle here, it's a lenticular one. You look at it from an angle and it shows Luke Skywalker, and on the other one you can see Darth Vader. My room is not very organized! I wish it were. You should see the trundles under my bed. I use them as storage drawers instead of beds and they are full of my toys and are very jumbled! A lenticular puzle sounds awesome! I'm not much for puzzles, but that Cheburashka puzzle sure is cute! Congratulations on being able to finish it in one day! Are you going to leave it on display for a while? I have a puppy puzzle that some friends sent me. I used to have a HUGE Da Vinci Code puzzle, too, but that was too intimidating that I eventually gave it away! I left the puzzle up for a few days, but I was worried that Chaika would knock it over. Have you done your puppy puzzle? Nice puzzle! I don't have any puzzles right now, but I used to have a princess one with over a thousand pieces. I never got around to doing it, though. Wow, a thousand pieces? That will take you a long time! Puzzles are pretty fun. During the summer program I do in America, some friends and I did a fox puzzle. 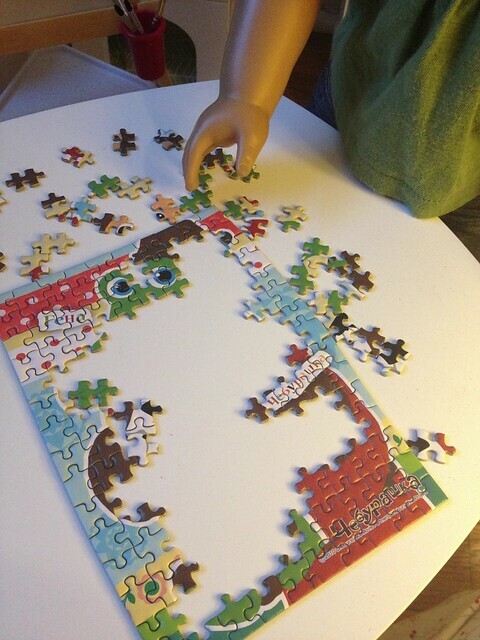 It gets really frustrating doing puzzles in large groups because there are always so many hands in the way. I do prefer other games, though. Lilly always brings good ones to the summer program. I like Quelf and Cards Against Humanity! I love doing puzzles! I find one of the worst things is having your favorite puzzle miss the best piece! It's awful. I know exactly what you mean! I had another Cheburashka puzzle and unfortunately, it's missing a piece. I never make it anymore because it just makes me so sad that I can't complete it.